Although I liked horror in my early teens, I really don't read much of it anymore. However, I would pick Stephen King. I love his story ideas and he has an excellent grasp of pacing and suspense. The room is an appalling mess. The entire floor seems to be covered with books. I asked myself what my father would have done if he'd been facing a problem like this--he always considered himself a bit of a philosopher. A visitor calls with a gift and a message from the past in this literary, historical novel. In 1802 Thomas de Quincey, a young man from a comfortable middle-class background who would go on to become one of the most celebrated writers of his day, collapsed on Oxford Street and was discovered by a teenage prostitute who brought him back to her room and nursed him to health. It was the beginning of a relationship that would introduce Thomas to a world just below the surface of London's polite society, where pleasure was a tradeable commodity and opium could seem the only relief from poverty. Yet it is also a world where love might blossom, and goodness survive. The lives of a street girl, an aspiring writer, and a freed slave cross and re-cross the slums of London in this novel about the birth of passion, the burden of addiction, and the consolations of literature. I've run into this one recently. Not my normal reading but it keeps catching my eye. And it sounds like a perfect story to make into a movie. Yes, I think it would make a good film. That beginning was enough to pull me in! :-) Happy weekend! I'm curious about this one. Lovely cover, too. Thanks for sharing, and for visiting my blog. I enjoy high suspense books, but probably lean more toward thriller than horror in my tastes. Still, there are horror books I enjoy. I am not sure I could pick a favorite author though. 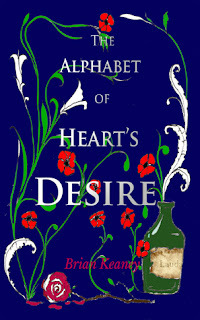 This is the first I've seen of The Alphabet of Heart's Desire, but it sounds intriguing. I'm a total sucker for horror books! :) Love Stephen King! I must read some of his newer stuff like The Dark Tower. I enjoyed the movie recently. Thanks for the visit, Lauren. Happy Reading! Beautiful cover and interesting excerpt. Hope you enjoyed your weekend! Thanks Alicia. See you again next time. Love your book choice! Hope you had a great weekend! I don't tend to pick up horror books too, most of the books I read in the genre were from when I was younger - a lot of people chose Stephen King as a favourite, but I have yet to read any of his books! Yes, I grew out of scaring myself when I hit my mid-teens. Great blog hop answer Nicki thank you so much for stopping by my blog hop last week.